**For the best service, buy from Royalmailers** High Speed Direct Thermal Label Printer (No Toner or Ink Required). The Zebra ZP-450-CTP Direct Thermal label printer was designed specifically to print shipping labels. The compact sleek design makes this desktop printer ideal for busy work environments. 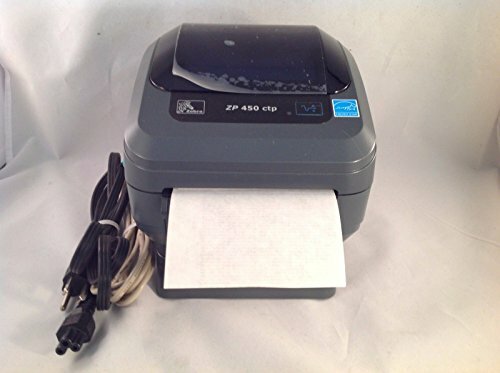 This printer connects to your computer by USB or serial port offering ease-of-use, and, at 5 ips is one of the fastest direct thermal printers in its class. The ZP-450-CTP can print all types of labels (UPS, FedEx, Endicia, Stamps.com, etc) and is compatible with all Windows OS. This printer is a replacement for the LP-2844 printer. *Please note that this printer is not compatible with Mac OS or shipments processed directly through USPS.com. **Orders must be placed before 3:00pm PST to receive next business day delivery to CA & NV.